Objective: To establish whether cannabis is an effective and safe treatment option in the management of pain. Data sources: Electronic databases Medline, Embase, Oxford Pain Database, and Cochrane Library; references from identified papers; hand searches. Study selection: Trials of cannabis given by any route of administration (experimental intervention) with any analgesic or placebo (control intervention) in patients with acute, chronic non-malignant, or cancer pain. Outcomes examined were pain intensity scores, pain relief scores, and adverse effects. Validity of trials was assessed independently with the Oxford score. Data extraction: Independent data extraction; discrepancies resolved by consensus. Data synthesis: 20 randomised controlled trials were identified, 11 of which were excluded. Of the 9 included trials (222 patients), 5 trials related to cancer pain, 2 to chronic non-malignant pain, and 2 to acute postoperative pain. No randomised controlled trials evaluated cannabis; all tested active substances were cannabinoids. Oral delta-9-tetrahydrocannabinol (THC) 5-20 mg, an oral synthetic nitrogen analogue of THC 1 mg, and intramuscular levonantradol 1.5-3 mg were about as effective as codeine 50-120 mg, and oral benzopyranoperidine 2-4 mg was less effective than codeine 60-120 mg and no better than placebo. Adverse effects, most often psychotropic, were common. Conclusion: Cannabinoids are no more effective than codeine in controlling pain and have depressant effects on the central nervous system that limit their use. Their widespread introduction into clinical practice for pain management is therefore undesirable. In acute postoperative pain they should not be used. Before cannabinoids can be considered for treating spasticity and neuropathic pain, further valid randomised controlled studies are needed. The recent clamour for wider access to cannabis or cannabinoids as analgesics in chronic painful conditions has some logic. Humans have cannabinoid receptors in the central and peripheral nervous system,1 although the functions of these receptors and the endogenous ligands may yet be unclear. In animal testing cannabinoids reduce the hyperalgesia and allodynia associated with formalin, capsaicin, carrageenan, nerve injury, and visceral persistent pain.2 The hope then is that exogenous cannabis or cannabinoid may work as analgesics in pain syndromes that are poorly managed. The spasms of multiple sclerosis and resistant neuropathic pain are two obvious targets. The background to this debate about legitimising cannabis (also called marijuana)—from the plant Cannabis sativa—for analgesic use is that the drug has been used both therapeutically and recreationally for thousands of years.3 In Britain doctors were able to prescribe cannabis as recently as 1971,4 and in a 1994 survey 74% of UK doctors wanted cannabis to be available on prescription, as it had been until 1971.5 The debate has included both the natural chemicals that act on cannabinoid receptors and the synthetic cannabinoids. The synthetic nabilone is the only legally available cannabinoid preparation in the United Kingdom and is licensed solely for use in nausea and vomiting induced by chemotherapy. Delta-9-tetrahydrocannabinol (THC) is the most potent cannabinoid, and although it is available in the United States, it is not licensed for use in the United Kingdom. The evidence used in the public debate about the analgesic efficacy of cannabinoids in humans has been gathered in a less than systematic manner and has often been taken from low quality study designs, such as anecdotal reports, questionnaires, or case series.4 The purpose of this systematic review was to find all of the randomised controlled trials of therapeutic use of cannabis in the management of human pain and then to obtain the best estimates of the efficacy of cannabis compared with either conventional analgesics or placebo. We also sought evidence of adverse effects (safety). Decisions about therapeutic cannabinoids, either about medical availability or about future research, should be based on the best available evidence of efficacy, safety, and tolerability. This systematic review was designed to provide that evidence for cannabinoids used as analgesics. Two authors (MRT and DC) searched independently, using different search strategies in Medline (for 1966-99), Embase (1974-99), the Oxford Pain Database (1950-94),7 and the Cochrane Library (1999, issue 3). The most recent search was done in October 1999. The search included different combinations of the following MeSH headings and “free text” terms: marijuana, marihuana, mariuana, cannabis, cannabinoids, THC, delta-9-tetrahydrocannabinol, nabilone, pain, analgesia, and random*, and different combinations of these terms. Additional reports were identified from the reference lists of retrieved reports and review articles. The search included data in any language. Pharmaceutical manufacturers and authors were not contacted. Only full publications in peer reviewed journals were considered for inclusion in the review. Unpublished data were not sought. Data from review articles, case reports, abstracts, and letters were not included. 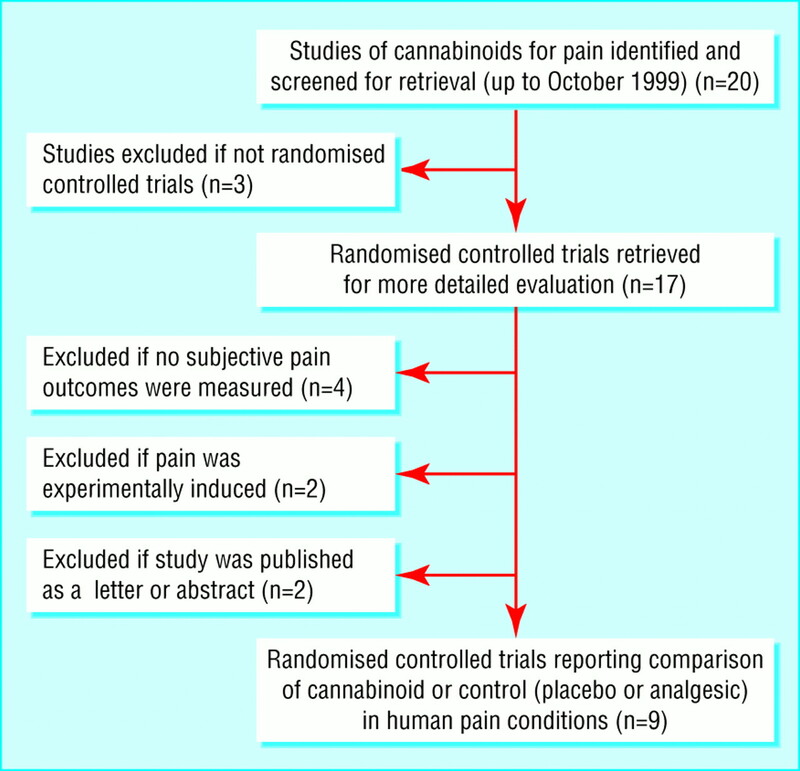 Randomised controlled trials of cannabis and its active constituents (namely, cannabinoids) in human pain were sought systematically. Studies of experimental pain were excluded. Relevant papers had to report on comparisons of cannabis or cannabinoids (experimental intervention, given by any route of administration) with any analgesic or placebo (control intervention). All retrieved reports were checked for inclusion and exclusion criteria by two authors (MRT, DC). Reports that were definitely not relevant were excluded at this stage. All potentially relevant reports that could be described as a randomised controlled trial were read independently by each of the authors and were scored for quality with the validated, 3 item Oxford scale.8 This scale takes into account proper randomisation, double blinding, and reporting of withdrawals and dropouts. Data extraction was done by one author (FAC) and cross checked by at least two other reviewers. Discrepancies were resolved by consensus. The following information was extracted from each report: the type, dose, and route of administration of cannabinoids; the controls; the types of pain; the sample size; the study design and duration; outcome measures for pain intensity; pain relief; the use of supplementary analgesia; patients' preferences; and adverse effects. Quantitative meta-analysis with pooling of data from the eligible randomised controlled trials was proposed. Because of the different cannabinoids, regimens, and comparators, numerous clinical settings, different follow up periods, and a large variety of outcome measures used in these trials, pooling of data for meta-analysis was inappropriate. Results were therefore summarised qualitatively. In the five trials on cancer pain 128 patients were studied (table). In one study oral benzopyranoperidine (a THC congener) 2-4 mg was not as effective as codeine sulphate 60-120 mg and no more effective than placebo in 37 patients.21 Oral THC 5-20 mg was found to have an analgesic effect when compared with placebo in 10 patients with pain related to advanced cancer.22 In this study a dose-response relation was shown for analgesia but also for adverse effects. In a further study by the same group oral THC 10 mg was found to be about equipotent to codeine 60 mg, and THC 20 mg was about equipotent to codeine 120 mg.23 The higher dose was associated with unacceptable adverse effects. In one trial a synthetic nitrogen analogue of THC given orally was superior to placebo and equivalent to about 50 mg of codeine phosphate.24 In a second study in the same report this nitrogen analogue was found to be superior to placebo and to 50 mg of secobarbital.24 In both of these trials the nitrogen analogue of THC was felt to be not clinically useful because of the frequency of adverse effects. Two patients were studied in two “n of 1 within patient crossover” trials for six weeks and five months respectively (table). In an experienced cannabis user with familial Mediterranean fever, THC was found to be no better than placebo in terms of visual analogue scores for pain intensity.25 Level of morphine use for breakthrough pain was significantly lower, however, while the patient was taking THC than while taking placebo (170 mg v 410 mg per three weeks). In a patient with neuropathic pain and spasticity secondary to a spinal cord ependymoma, THC 5 mg and codeine 50 mg were equianalgesic, and both were superior to placebo.26 Only THC, however, had a beneficial effect on spasticity. Thirty six patients were studied in two trials (conducted as a two phase study) (table).27 Levonantradol was more effective than placebo when given intramuscularly to patients with postoperative pain.27 Adverse effects with levonantradol were common, although considered mild. We found nine randomised trials evaluating the analgesic efficacy and safety of cannabinoids. These trials, of either acute or chronic pain, suggest that little useful analgesia can be expected from single dose cannabis in nociceptive pain. All the trials had a quality score of 3 or above and therefore are unlikely to be biased. They were predominantly single dose experiments. In eight of the nine trials intramuscular and oral cannabinoids were more effective analgesics than placebo but no more effective than oral codeine 50-120 mg. In the two postoperative pain trials levonantradol was superior to placebo but no more effective than codeine.27 Such a level of efficacy makes cannabinoids unlikely to be useful, certainly for moderate or severe postoperative pain. Meta-analyses of single dose studies in patients with acute pain found that the number needed to treat for at least 50% pain relief ranged from 2 to 5 compared with placebo for non-steroidal anti-inflammatory drugs and paracetamol. The number needed to treat for codeine 60 mg was much less useful, at 16.28 If cannabinoids can deliver analgesia only equivalent to codeine 60 mg, with a presumed number needed to treat of about 16 for at least 50% pain relief, they are unlikely to have a place in acute pain treatment. No large trials examined cannabinoids in cancer pain and chronic non-malignant pain. Only two trials had treatment group sizes of more than 30. 21 23 All five trials in cancer pain were single dose, and four found the cannabinoid as effective as codeine, but with dose limiting adverse effects. 22 23 24 Benzopyranoperidine, tested in one trial, was ineffective compared with both codeine and placebo.21 In chronic non-malignant pain we found two “n of 1 within patient crossover” trials. In a patient with abdominal pain related to familial Mediterranean fever, neither THC nor placebo produced pain relief, but with THC the patient used less additional morphine for breakthrough pain.25 In Maurer et al's n of 1 study of THC 5 mg for neuropathic pain and spasticity, the reduction in pain intensity was similar to that for codeine 50 mg, but only THC reduced spasticity.26 We found no trials evaluating smoked cannabis for pain management, but one trial compared the effect of smoked marijuana with smoked placebo on postural balance in patients with spastic multiple sclerosis.16 The smoked marijuana was associated with subjective improvement of symptoms and with objectively measured impaired posture and balance in all subjects. The best that can be achieved with single dose cannabis in nociceptive pain is analgesia equivalent to single dose codeine 60 mg, which rates poorly on relative efficacy compared with non-steroidal anti-inflammatory drugs or simple analgesics. Increasing the cannabinoid dose to increase the analgesia will increase adverse effects. More intriguing perhaps than these relatively negative analgesic results in nociceptive pain are the suggestions of efficacy in spasticity and in neuropathic pain, where the therapeutic need is greater than in postoperative pain. We found insufficient evidence to support the introduction of cannabinoids into widespread clinical practice for pain management—although the absence of evidence of effect is not the same as the evidence of absence of effect. Any research agenda needs to be clear, however, and this review may be helpful in defining the agenda. Cannabis is clearly unlikely to usurp existing effective treatments for postoperative pain. New safe and effective agonists at the cannabinoid receptor may dissociate therapeutic from psychotropic effects and make randomised comparisons in neuropathic pain and spasticity worth while. Contributors: FAC, MRT, and DC initiated the project and searched, extracted, and analysed the data. DJMR, RAM, and HJMcQ cross checked the extracted data. All authors participated in discussing the results and in writing the paper. FAC is the guarantor for the paper. Funding MRT was supported by a PROSPER grant from the Swiss National Research Foundation (No 3233-051939.97). DC was supported by the Royal College of Nursing Institute's Research Assessment Exercise grant. Competing interests None declared. DC is currently employed by Pfizer; the change of employment occurred after the work in this study was completed. .Cannabinoids are anti-allodynic in rats with persistent inflammation.Pain1999;82(2):199–205. .Basic mechanisms of cannabinoid-induced analgesia.IASP Newsletter1999;summer:3–6. .Adverse effects of cannabis and cannabinoids.Br J Anaesth1999;83:637–649. .Therapeutic uses of cannabis.Amsterdam: Harwood Academic,1997. .Doctors want cannabis prescriptions allowed.BMA News Review1994;February:1–19. .Cannabinoids for control of chemotherapy-induced nausea and vomiting: quantitative systematic review.BMJ2001;323:16–21. .Developing a database of published reports of randomised clinical trials in pain research.Pain1996;66:239–246. .Assessing the quality of reports of randomized clinical trials: is blinding necessary?Control Clin Trials1996;17(1):1–12. .Improving the quality of reports of meta-analyses of randomised controlled trials: the QUORUM statement.Lancet1999;354:1896–1900. .Effects of moderate and high doses of marihuana on thermal pain: a sensory decision theory analysis.J Clin Pharmacol1981;21(suppl 8–9):S299–S310. .Marihuana and pain.J Pharmacol Exp Ther1974;188:415–418. .Treatment of human spasticity with delta 9-tetrahydrocannabinol.J Clin Pharmacol1981;21(suppl 8–9):S413–S416. .Effect of marihuana and placebo-marihuana smoking on angina pectoris.N Engl J Med1974;291:65–67. .Delta-9-THC in the treatment of spasticity associated with multiple sclerosis.Adv Alcohol Subst Abuse1987;7(1):39–50. .Controlled clinical trial of cannabidiol in Huntington's disease.Pharmacol Biochem Behav1991;40:701–708. .Short-term effects of smoking marijuana on balance in patients with multiple sclerosis and normal volunteers.Clin Pharmacol Ther1994;55:324–328. .Effects of intravenous tetrahydrocannabinol on experimental and surgical pain. Psychological correlates of the analgesic response.Clin Pharmacol Ther1977;21(1):26–33. .Marijuana-produced changes in pain tolerance. Experienced and non-experienced subjects.Int Pharmacopsychiatry1975;10:177–182. .Nabilone in the treatment of multiple sclerosis.Lancet1995;345: 579. .A study of levonantradol, a cannabinol derivative, for analgesia in post operative pain.Pain 1981; (suppl): S37. .Effect of benzopyranoperidine, a delta-9-THC congener, on pain.Clin Pharmacol Ther1978;24:223–227. .Analgesic effect of delta-9-tetrahydrocannabinol.J Clin Pharmacol1975;15:139–143. .The analgesic properties of delta-9-tetrahydrocannabinol and codeine.Clin Pharmacol Ther1975;18(1):84–89. .Effect of a nitrogen analog of tetrahydrocannabinol on cancer pain.Clin Pharmacol Ther1978;23:397–401. .Pain relief with oral cannabinoids in familial Mediterranean fever.Anaesthesia1997;52:483–486. .Delta-9-tetrahydrocannabinol shows antispastic and analgesic effects in a single case double-blind trial.Eur Arch Psychiatry Clin Neurosci1990;240(1):1–4. .Evaluation of intramuscular levonantradol and placebo in acute postoperative pain.J Clin Pharmacol1981;21(suppl 8–9):S320–S326. .An evidence-based resource for pain relief.Oxford: Oxford University Press,1998. .Relief of pain by oral medications. A controlled evaluation of analgesic combinations.JAMA1974;229:55–59.